At Snyder, we were not content to just develop a new line of polyethylene tanks for the on-tie market. We incorporated a "new concept" of design to further enhance the leak proof properties of the tank and improve the structure to minimize deformation of the tank and maximize tank life. The result is the best performing on-site tank available in the marketplace. 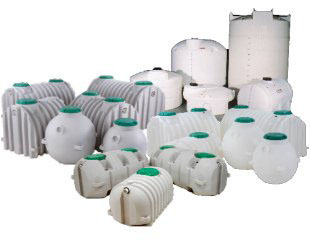 Review the following list to see why our tanks are the growing choice for on-site application. One-piece seamless construction - NuConSept tanks are rotationally molded to resist leaking and cracking better than concrete and fiberglass. Unlike other materials, they will not rust or corrode and require no additional coating. Extra strength design - Snyder tanks combine aggressive rib design with a special parabolic shape. This provides structural strength not found in other on-site polyethylene products. Structurally superior double-wall manhole covers are standard. Lifting ears - molded-in feature provides an aid when lowering tank into hole. Leak proof seal - improved design features ensure a leak proof seal of the lid or manhole extension to the manhole of the tank. This prevents groundwater from entering the tank and causing premature failure of the leach field. Reinforced manhole - special molded-in reinforcement ring resists deformation.